Scarlett is continuing to grow, and her palate is expanding every day. She’s asking for what I’m eating, is learning to eat from pouches and spoons and is engaging in her meals. We’re revisiting her less-than-favorite flavors and trying her preferred provisions in various textures. 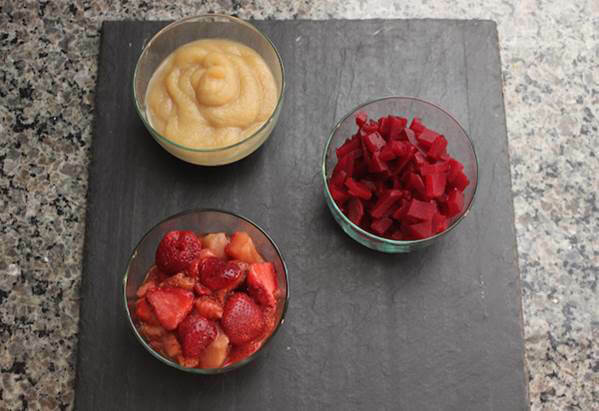 For example, we stepped up from pureed bananas to picking up small pieces and leaned into trying chunkier blends of veggie purees. I learned in my college nutrition class to “eat the rainbow.” What that means is to include fruits and vegetables in my diet that range over the ROYGBIV spectrum. I’d like to teach Scarlett and Red to eat this way, too, so I’m now looking to incorporate bright and intensely colored purees into their diets. I decided that beets, one of the most bold, intense of the colors, should be next up on Scarlett’s plate! 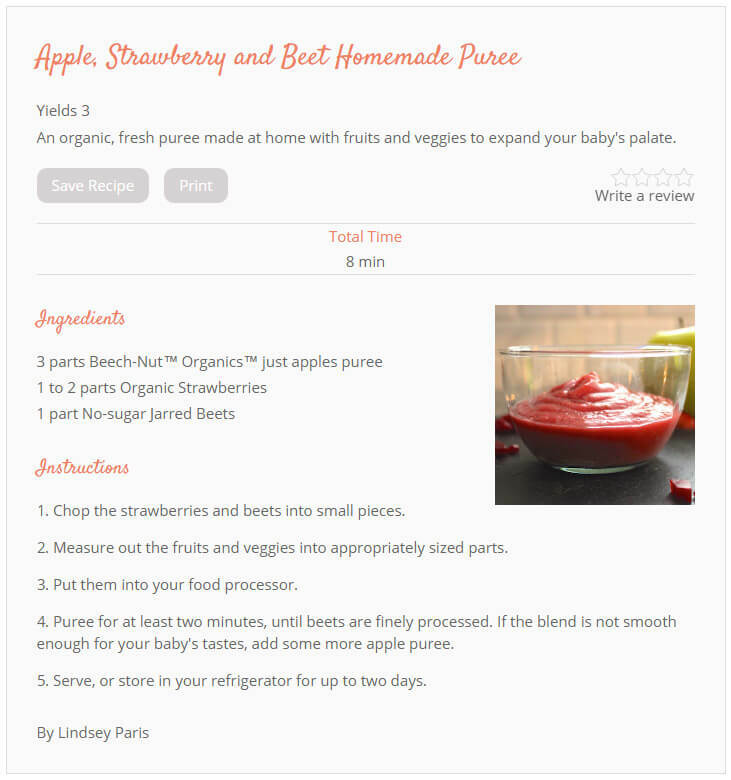 My inspiration was Beech-Nut® Organics™ Stage 2 just apple, strawberry & beets. 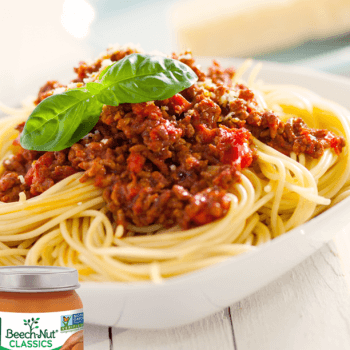 If you’re like me and don’t always have time to make your baby’s food at home, Beech-Nut is the next best thing. 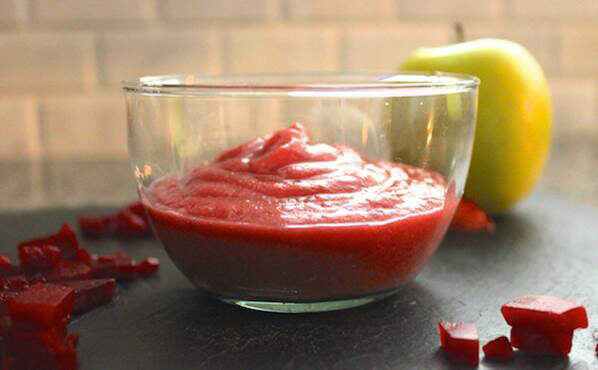 To temper the somewhat strong (in my opinion) flavor of beets and to bring Scarlett’s palate up to task, I decided to puree beets with apples and strawberries. 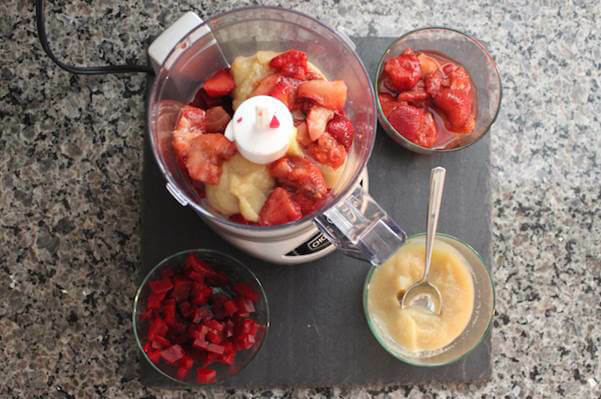 I added 3 parts Beech-Nut® Organics™ just apples, 2 parts organic strawberries and one part organic jarred beets into a food processor. 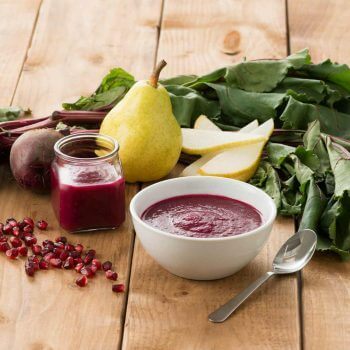 I blended for a short time, and even added a bit more apple puree to get the beet pieces to finely process into the mixture. 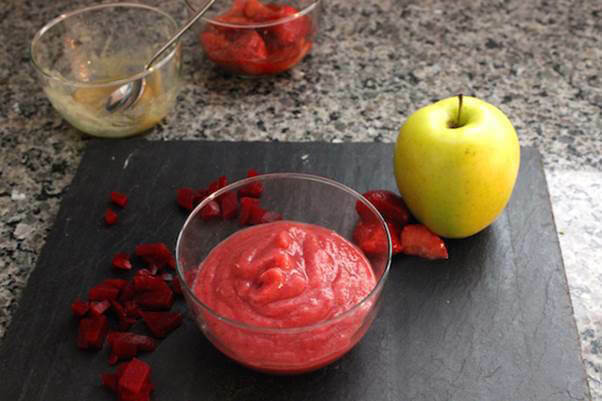 You can adjust the blend’s consistency with more or less apple puree. The color alone was something very pleasing to the eye! 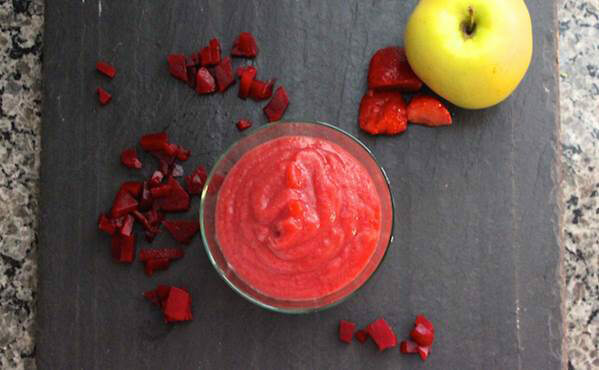 Bright red, creamy, fruity and oh, so yummy. It was slightly tart, naturally sweet, and all organic! I even tried some on my morning toast instead of the regular butter, and was very happy. It was as sweet as jelly, but had more natural grit (strawberry seeds!) and a much more complex flavor. Scarlett LOVED the color of the homemade puree, adding plenty of “ooooohs and ohhhhhhhs!” when I set it down in front of her. Spoons being optional in her opinion, I let Scarlett explore its texture. Shortly after her sensory exploration, she decided it was time to try it for herself, bringing her red fingers to her mouth. I was so happy when the puree elicited a happy reaction. A quick wipe down later and I was spooning more into her mouth. I made sure to save the other small portions for the fridge in a sealed container, which stays good for up to two days. Try Beech-Nut® Organics™ Stage 2 just apple, strawberry & beets for a quick and fresh meal for your child… or a flavorful option for your morning toast!